With the onset of new media, customers rarely pick up the phone and call customer support, especially when there is a complaint. Having to be put on hold for 10 minutes is reason enough not to call at all. But people need and want to be heard still and for companies to thrive, they still need an outlet to listen. 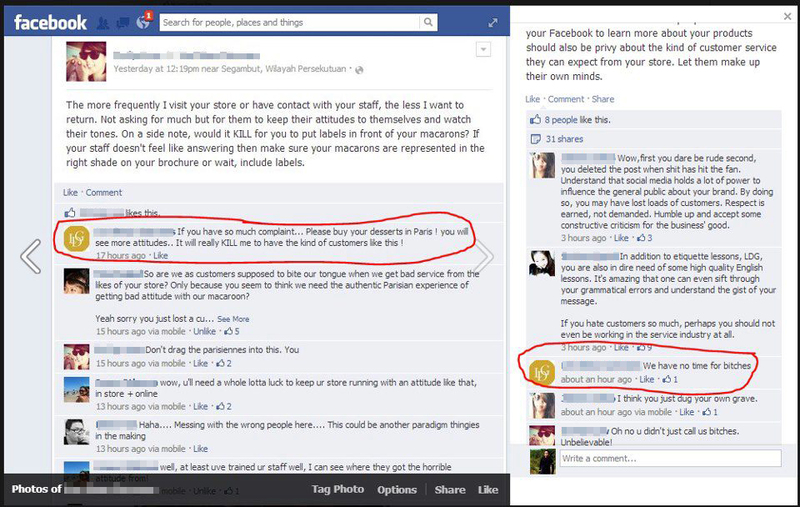 Customers now turn to social media and emails to voice their concerns. One of the key reasons (other than promotions/free gifts) why someone ‘likes’ the Facebook fan page of a global brand is to voice their concerns online. Fast and hidden behind a computer screen, customers can now bypass the awkwardness of having to speak live to a customer service officer, something shy and inhibited people tend to avoid. And boy are customers talking a lot online. Just a quick glance at any major brand like KFC or McDonald’s Facebook, and you will find a stunning number of feedback comments scrawled on their timeline. Yet big MNCs know that complaints are not to be taken lightly. Each wall comment is personally replied to and if needed, referred to the proper channels for compensation. This is very good practice and every company needs to address their clients before a social media meltdown occurs like ‘Amy’s baking company’. By the way, a very good article was written on social media lessons learnt if you follow the link provided, but the short version is: NEVER EVER INSULT YOUR CUSTOMERS ONLINE. Not just complaints but many potential buyers now use social media to enquire about products, specifications, location and a myriad of other related subjects. Given this increased ease to voice their queries, response expectations are also increased proportionately. In a way, consumers are getting very pampered and used to instant gratification. No longer is ‘office hours’ a valid excuse not to respond, as it is now assumed that everyone, including corporations, should be constantly connected to social media. If your company is still sticking to the old ways of checking only during office hours and weekdays, it’s time to get plugged in. Download social media apps on your phone, get cross-platform programs like Hootsuite– whatever it takes to allow yourself to be more connected to your prospects. Not only do you get feedback to change faster, you can correct and respond to any mishaps and contain a social media nuclear bomb before it goes off. If you still doubt how bad a social media complaint can be, just check out Les Deux Garcon (excellently drawn summary from 9gag included), where social media can multiply complaints a million fold. A dissatisfied customer used to tell between 9-12 people about their experience, but now, 1 pissed off redditor/9gagger can easily tell thousands. Social media has become a channel integrated with customer satisfaction, so do take special care to nurture and speak to every post, no matter how trivial it seems as it is an excellent vanguard indicator of sentiments.